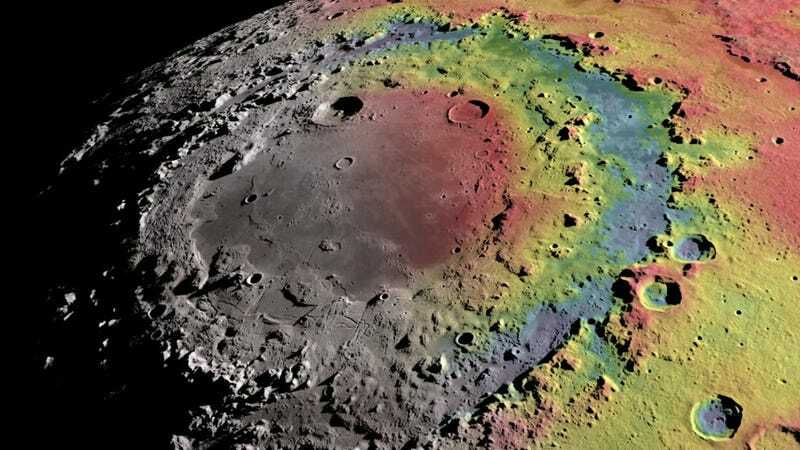 Topographic map of the Orientale impact basin on the Moon. Scientists who study ancient impact craters on Earth have a problem: erosion. Weathering, volcanism, tectonics, and other geological processes have swept away the traces of our planet’s oldest impact craters, making it difficult to chronicle the history of asteroid impacts on Earth. New research published today in Science suggests the Moon, with its extensive collection of impact craters, can help. As neighbors, the Earth and Moon have experienced similar rates of asteroid strikes over the course of the Solar System’s history. But the Moon, unlike Earth, isn’t subject to the same erosional processes. Consequently, the Moon’s surface has retained a long-term record of its impact history. If these lunar craters can be dated, then it should be possible to recreate the historical bombardment rates on Earth. Craters on the Moon larger than 10 kilometers (6 miles) and younger than 1 billion years old. By using a new technique to date lunar craters from a distance, a research team led by Sara Mazrouei from the Department of Earth Sciences at the University of Toronto were able to accomplish exactly this. The technique allowed them to date lunar craters with diameters greater than 10 kilometers (6 miles) and younger than 1 billion years. This exercise yielded two important findings, both of which challenge conventional notions of Earth’s impact record. The first is that the impact rate on Earth increased by a factor of 2.6, or between two and three times, about 290 million years ago, at the end of the Paleozoic Era and just slightly before the appearance of dinosaurs. The second big finding, in the words of the researchers, is the “almost complete absence of terrestrial craters older than 650 million years.” This absence, according to the researchers, suggests a “massive global-scale erosion event near that time.” The event they’re talking about is the theorized Snowball Earth—a time when most if not all of our planet was coated in ice. The idea that the frequency of impacts on the Moon and Earth has jumped since 290 million years ago goes against conventional thinking. Theoretically, the rate of asteroid strikes should be decreasing—and not increasing—as the debris left over from the formation of the Solar System gradually dissipates. The authors of the new study are presenting a big claim—one requiring the requisite big evidence. And indeed, some of the experts we spoke to weren’t entirely convinced by the new paper, saying it relied on too many assumptions, the methods weren’t persuasive enough, and that more evidence is needed to back the claims. To date the lunar craters, Mazrouei’s team used thermal data and images collected by NASA’s Lunar Reconnaissance Orbiter (LRO). A device on the LRO called the Diviner provided this data by measuring the heat radiating from the Moon’s surface. At night, large rocks give off more heat than fine soil, allowing the Diviner to do its work. And it just so happens that young craters on the Moon are surrounded by large rocks. With this technique, the researchers were able to compile the ages of all lunar craters younger than around a billion years—a rather time-consuming process, to be sure. A map showing some of the Moon’s younger craters. As noted, Mazrouei and her colleagues correlated the age of lunar impact craters with those on Earth. The common belief among scientists is that many of Earth’s craters have been wiped away by geological processes, but by comparing the lunar craters to terrestrial ones, Mazrouei and her colleagues showed that, for very large craters—those bigger than 20 km (12 miles) in diameter and younger than 650 million years—a complete record of terrestrial impact craters does in fact exist. To be clear, however, this only applied to craters found on stable terrains, excluding areas like the oceans, the Amazon, and so on. Analysis of this data exposed the frequency spike in impacts starting around 290 million years ago, but it yielded other interesting findings. By re-assessing the terrestrial impact record, the researchers discovered a dearth of craters on Earth between 300 million and 650 million years ago during the Precambrian. This surprising deficit of craters, according to the study, is not the result of erosion, but rather an unexpected decline in asteroid impacts during this historical period. Given erosion rates on stable continental terrains after 650 [million years ago], similar conditions further back in time would have allowed most craters of Precambrian age...to survive. Instead, the paucity of Precambrian craters is coincident with major episodes of globally extensive “Snowball Earth” glaciation. Pervasive subglacial erosion at approximately 650 to 720 [million years ago] is thought to have removed kilometers of material from the continents, enough to erase most existing...impact craters. It’s a fascinating possibility, and further evidence in favor of the burgeoning Snowball Earth hypothesis. The timing of this impact spike is quite interesting, and not just from an astronomical perspective. The apparent increase in impacts may have influenced the history of our planet. One of the largest extinction events happened around 250 million years ago—the Permian-Triassic mass extinction—which occurred shortly after the observed increase in the rate of asteroid impacts. As to whether or not Earth is more vulnerable to asteroid strikes in 2019 than it was 300 million years ago is something that could not be gleaned from the data. For now, “with our data we can say that the impact rate has increased in the past 290 million years,” said Mazrouei, but her team has not been able to “distinguish if there was just one spike, multiple spikes, or if this rate is still increasing.” For our sake, let’s hope it’s not the latter. The Manicouagan Crater in Canada dates back 200 million years. Another issue of contention for Melosh was how the researchers measured the rate at which boulders degrade around lunar craters over time. He said they didn’t measure boulder size directly, instead inferring the degradation rate from the speed at which the area around the crater cools after the Sun sets or warms when it rises. Melosh said the assumption that boulders break down at a constant rate via tiny meteorites is exactly that—an assumption. It’s completely plausible, he said, that the degradation rate increases as the boulders get smaller. Mazrouei and her colleagues have presented an intriguing new study, but it’s clear more work is required to solidify their case. Recreating the record of asteroid impacts on Earth is important, both for understanding our planet’s geological history and to better appreciate the influence of these cataclysmic impacts on the trajectory of life on this planet.